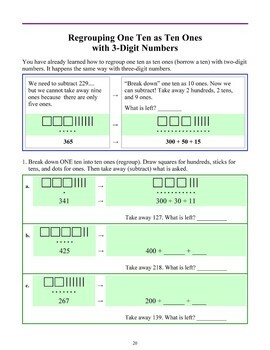 Then we study word problems with more and fewer, and also several techniques or "tricks" for mental subtraction. 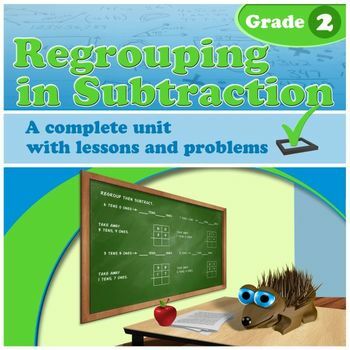 The word problems in the chapter require both addition and subtraction. I do not like putting only subtraction word problems to a lesson that is about subtraction. 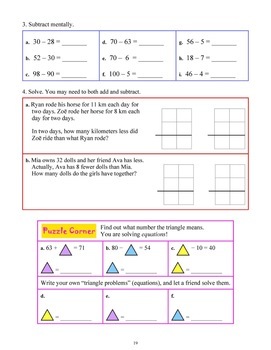 Students need to practice recognizing whether a problem requires addition or subtraction, thus each set of word problems typically includes both kinds. 1. Regrouping 1 ten as 10 ones, such as is needful for 546 − 229. 2. Regrouping 1 hundred as 10 tens, such as is needful for 728 − 441. 3. Regrouping two times (1 ten as 10 ones, and 1 hundred as 10 tens), such as is needful for 725 − 448. 4. Regrouping with zero tens, such as is needful for 405 − 278. Here, first we regroup 1 hundred as 10 tens, then 1 ten as 10 ones. In this unit, we ONLY study cases (1) and (2) from the list above. Again, students first practice the regrouping process with visual models. You could use base-ten blocks instead. At the end of the unit, students encounter bar graphs again. They also play Euclid's game, which is meant as a fun, supplemental lesson. You may omit it if time does not allow.